I have one excited little guy today. He can’t wait to head back to school and start his first full year of Preschool. We worked hard last night getting everything ready for school, including his FROZEN folder. His first school project is packed inside, his outfit all laid out, we even did a test run on school lunches this weekend. If there is one thing the whole house can agree on besides our love of learning, it’s FROZEN. I can’t believe it’s already been 9 months since the blockbuster released. It is still a part of our daily lives. 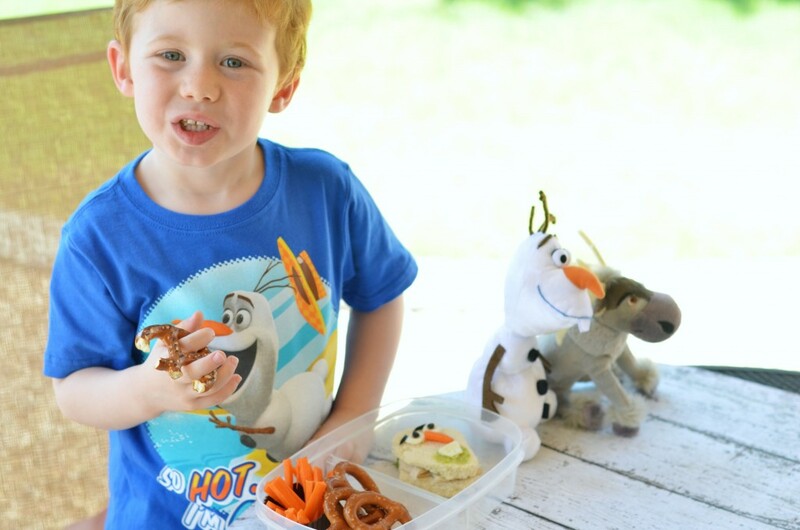 We belt out “Let it Go” in the car daily, enjoy a little character play with our Sven and Olaf toy, and take every advantage to make a “big summer blowout” reference. 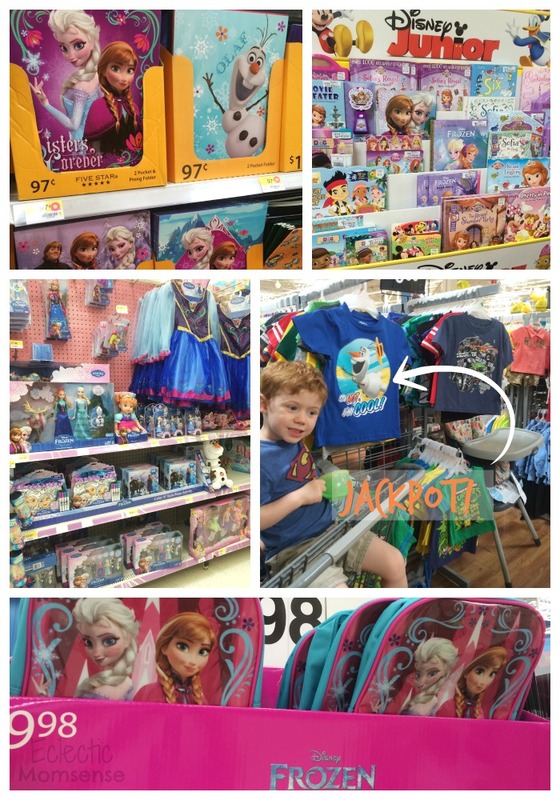 So, naturally when we went back to school shopping at Walmart FROZEN was definitely on the radar. We found quite a few school essentials including our Olaf folder, easy readers, and backpacks. We scoped out the toy section too, but had almost everything in stock from our last #FROZENFun haul. Our final stop was finding an Olaf shirt for his first week of school. We got lucky and found the last one in stock hiding on a rack. I had one excited preschooler. We know Olaf likes warm hugs and loves summer. 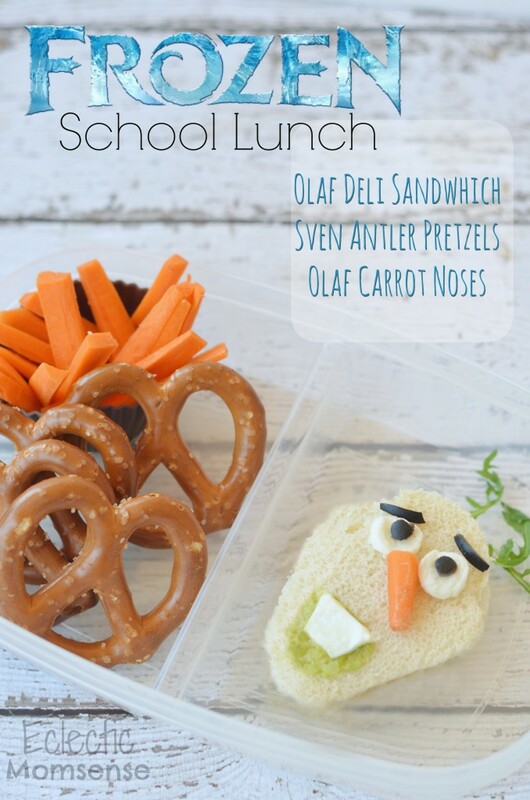 This FROZEN school lunch was the perfect way to commemorate the quirky little snowman. 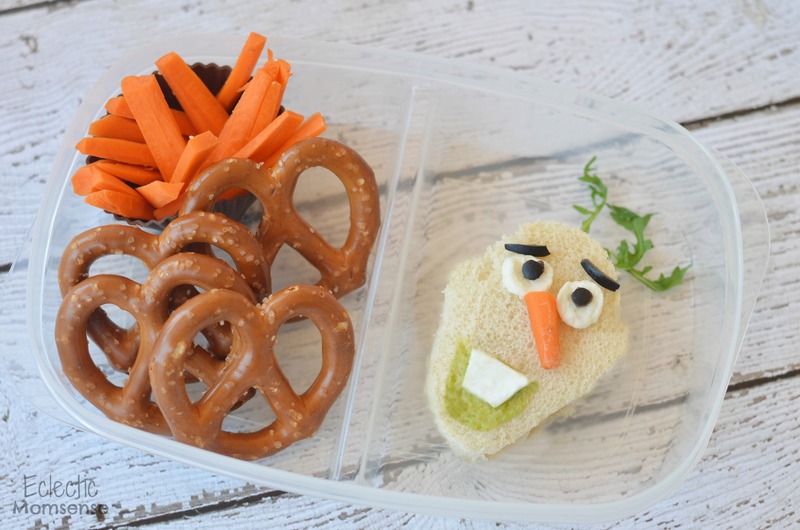 A turkey sandwich easily turned into the comic sidekick with a side of carrot noses and Sven antler pretzels. Assemble your turkey sandwich. Use the template to cut out your Olaf head. Cut out two circles of mozzarella cheese for his eyes. Use a straw to cut out two circles for his pupils. Use thin strips of olive for his eyebrows. Lay down a bit of avocado spread for his mouth. Cut out a trapezoid from the mozzarella for his teeth. Tuck a little arugula in for his hair. Lastly, prep your carrots and save the tip for his nose. 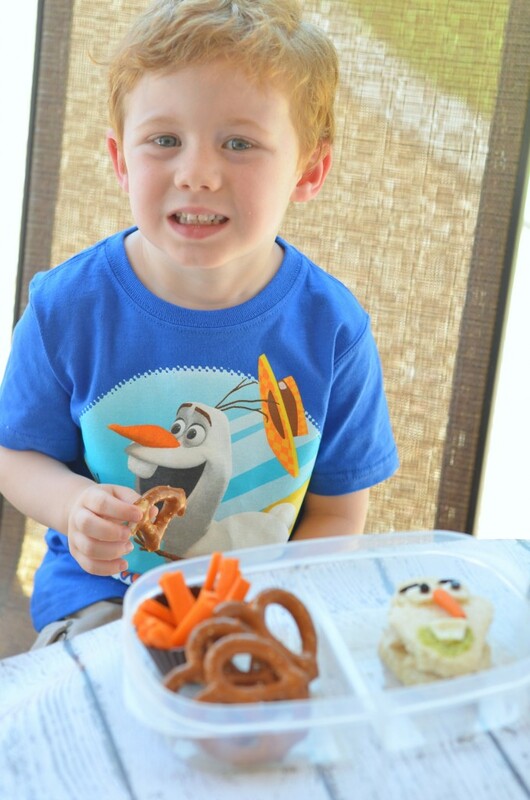 Keep the #FROZENFun going through the summer and into the school year. 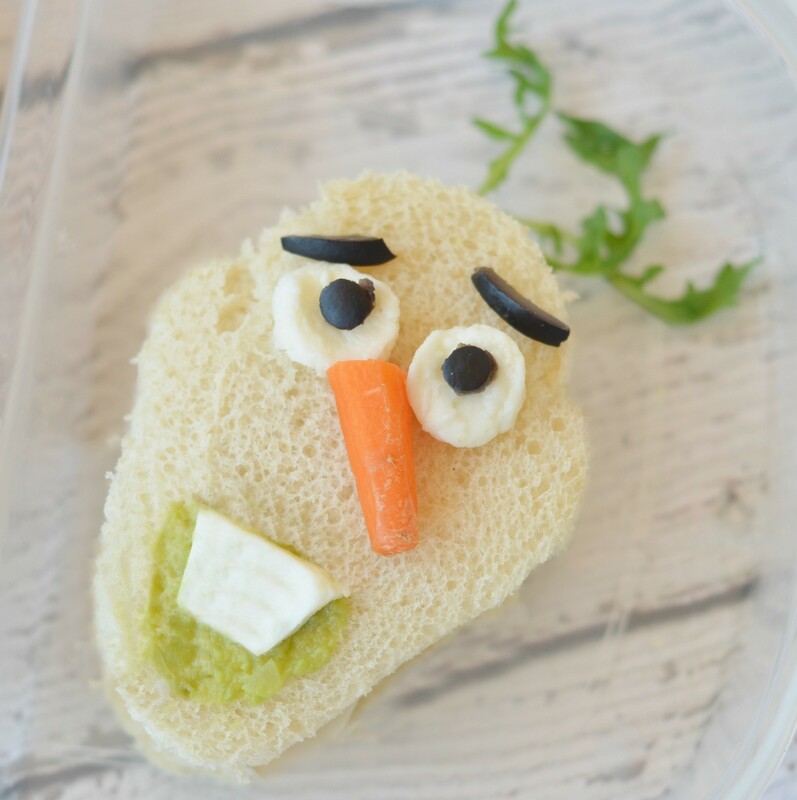 Make this Olaf deli sandwich for a fun after school snack or school lunch.